One of the best places to keep up with climate change — the Santa Clara Valley Water District Climate Change Portal — has gotten better (if I do say so myself). Water sector issues: water supply, water quality, floods, droughts, rainfall, etc. First, a shorter URL: http://apps2.valleywater.org/Climate_Change/. Second, the capability to combine topics and geographical areas to limit your search results. Let’s say you want to read research on sea level rise. 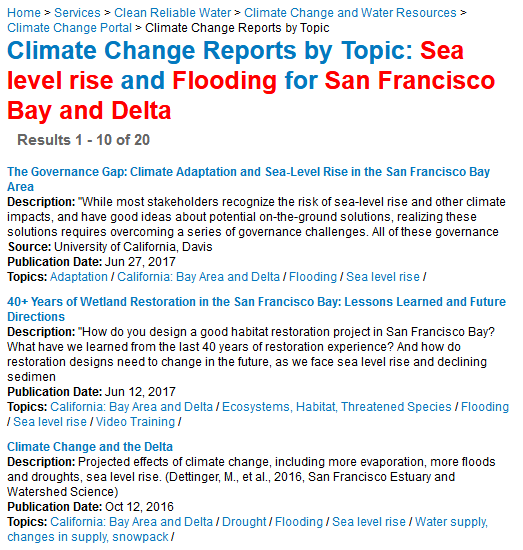 Under “Climate Change Reports,” you click “Browse by Topic” and scroll down to the Science section, then click on Sea Level Rise. You get 386 reports (as of this writing). Then, let’s say you’re interested in flooding as a result of sea level rise. So, you look under “Combine Topics” and click on Flooding. Now, you’re down to 108 reports. Then, you’re really interested in Bay Area effects. So, under “Limit by Place,” you choose San Francisco Bay and Delta and you get a more reasonable 20 reports. This entry was posted in climate change and tagged climate change, SCVWD. Bookmark the permalink.